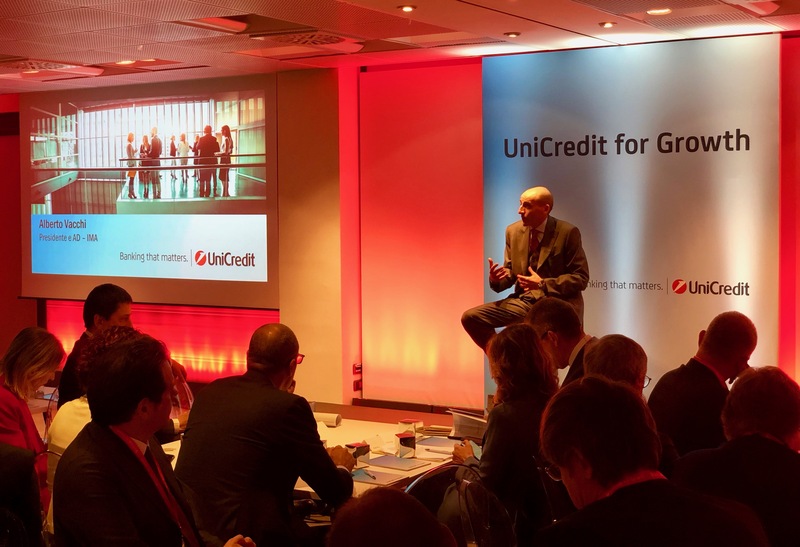 IMA has hosted at the Service Center UniCredit for Growth, third stage of the journey studied by the UniCredit Banking Group to accompany Italian companies of excellence, helping them to develop advanced strategies in new global and technological contexts. Major technological and social transformations, new consumer behaviours and very rapid substitutions of traditional business models are bringing about a revolution in the pillars of growth and require moments of reflection and discussion on the part of companies and banks. 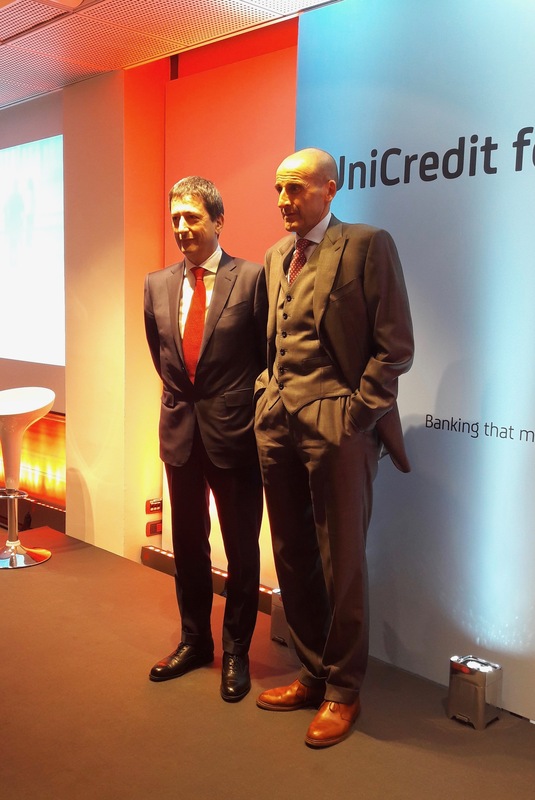 Governance and leadership 4.0 at the heart of the meeting opened with a message of welcome from Alberto Vacchi, IMA’s Chairman and CEO, and Lucio Izzi, Head of Corporate Sales & Marketing UniCredit. Guests included Andrea Casini, Co-CEO Commercial Banking Italy. The event was attended by more than 90 entrepreneurs. “We are pleased to host the UniCredit for Growth meeting at IMA’s headquarters. The event represents an opportunity for an exchange of views on the topic of Governance and leadership 4.0 in a territory that has always been characterised by the presence of formidable skills. These skills have generated a complex industrial system that we could define as “clusters” integrated with advanced mechanics and other sectors. The ability to create innovation is a top priority for our companies: IMA’s leadership imposes a highly competitive position also in the challenges of Industry 4.0. The IMA Digital programme, launched over two years ago, embraces all of the projects that represent the Group’s commitment to the evolution towards digitisation and consolidates a series of initiatives to optimize its internal and external processes: the result will be an improvement in terms of effectiveness and efficiency to offer an increasingly high value to our customers. We have interpreted it in a broad manner as part of a detailed, long-term project that recognises the fact that this is a competition for the creation and design of intelligent machines in increasingly intelligent factories. IMA Digital represents our approach to full implementation of 4.0, safeguarding our true strength that gives quality and reliability to the products and services that we offer, i.e. the people at all levels of our organisation and of the supply chains connected to us. A 4.0 logic that will lead to the elimination of many barriers, both within companies and between business networks, which will be increasingly connected and ready to face the challenges. Our end users always pose us new challenges, and we are competitive if we know how to give them not just answers, but also new ideas and new stimuli. Today, for example, the packaging world is addressing the subject of plastics. IMA has already launched an internal programme to make a useful contribution to this issue which involves us as an industry and as citizens committed to a sustainable economy. For this we will need new collaborations, new alliances and new skills”.